14 production licenses in the Barents were offered to 11 different companies during the recent APA18 awards. 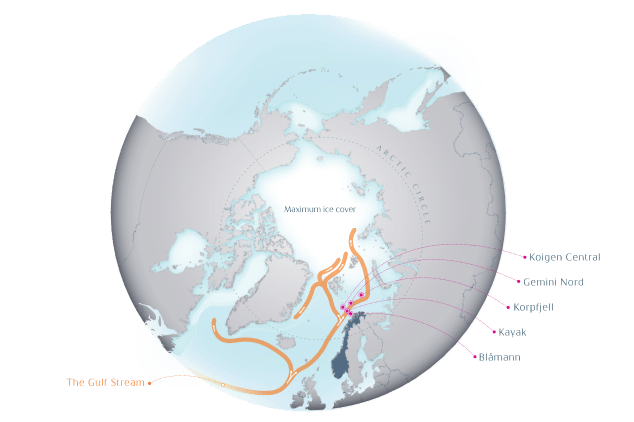 What can we learn about Barents Sea exploration strategy? The analysis of the APA18 awards can tell us more about which companies are exploring in the most northern oil province of the NCS and the exploration strategy of these Barents Sea players. Of a total of 83 awards, 14 production licenses were awarded in the Barents Sea. The most licenses awarded was DNO with 7 non-operated licenses. Aker BP (6-4 operated), Equinor (6-non-operated) and Lundin (5- 4 operated) follow closely. The remaining companies were all offered 1 or 2 licenses each. DNO has strong ambitions for the NCS, as became clear by their recent take-over of one of the most successful E&P companies on the NCS, Faroe Petroleum. Kent Høgseth from DNO Norge talked about the DNO exploration strategy on the NCS Exploration Strategy Conference last year where he explained that the focus had been mostly in the northern North Sea but now, they are looking more into the Barents Sea as well. They are participating in 2 wells in the Barents Sea this year: The Pointer/Setter well with Lundin as operator which is being drilled right now (read also “Lundin tests Cretaceous play in Hammerfest Basin”) and Korpfjell deep by Equinor later this year. DNO took over PL 859 when Chevron left the NCS last year. DNO adds 5 new licences in the Barents Sea to their exploration portfolio and 2 extensions to existing licenses operated by Lundin: PL767B, the license of Pointer/Setter and PL 902B at the southern edge of the Loppa High, just south of the Gohta discovery. 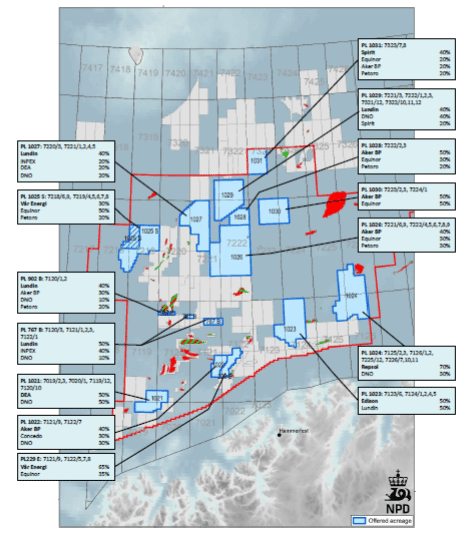 The 5 new production licenses are spread out over the APA open area of the Barents shelf. DNO seems to be looking at all opportunities in different plays and areas. 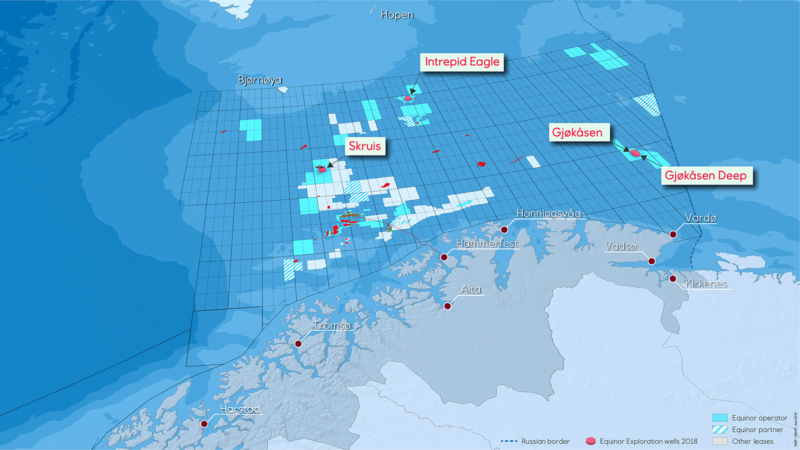 Equinor is the most active operator in the Barents Sea. Therefore, it is a bit surprising that they were rewarded only non-operated licenses in the APA18 round. In 2017, Statoil- at that time-, had a large exploration drilling campaign which was rather disappointing. Also, in 2018 a Barents Sea drilling campaign of 4 wells was undertaken which is still ongoing. Only small discoveries were made at Skruis close to Johan Castberg (read “Small discovery in the Barents Sea”) and at Intrepid Eagle (“More gas in the Barents Sea”) next to the Atlantis discovery. The Gjøkasen wells are currently in the process of being drilled (“High risk, high reward”) although operations have been halted for the time being due to a well control incident last Thursday 17th of January. The PSA is investigating the cause of the incident. Equinor has contracted the West Hercules rig to drill 2 additional wells in the Barents Sea in the spring of 2019. These wells are most likely on the Korpfjell deep and Shenzou prospects. 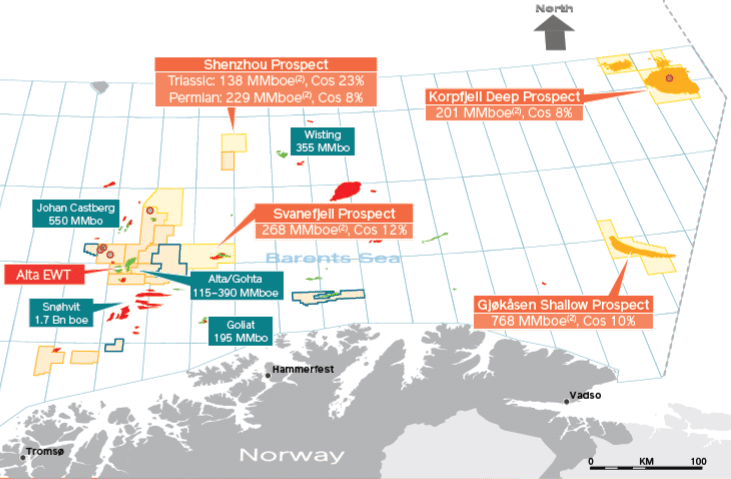 Aker BP is strengthening its position in the Barents Sea with 6 new production licenses of which 4 as an operator whereby it is strategically positioning itself for de-risking and high-grading of the Triassic play. Evy Glørstad-Clark, SVP Exploration for Aker BP explained that the reason for this is very simple: 50% of the yet-to-find in the Barents Sea is in the Triassic play. But the Triassic play is hard to unlock and apart from Goliat no commercial Triassic discovery has been made. “Looking into the petroleum system and the trapping system is key since stratigraphic traps haven’t worked yet.” says Glørstad-Clark. Although Aker BP has an extensive drilling programme on the NCS with 15 wells planned for 2019, drilling activity is low in the Barents Sea. Aker BP is only participating in 1 well, i.e. Gjøkåsen. The Permian play tests have been postponed to 2020. In 2018 the company drilled the Svanefjell prospect in the Barents Sea, a non-commercial gas discovery of possibly gas hydrates but that was the first well in 4 years’ time in the Barents Sea. Aker BP was also partner in Spirit Energy’s dry well on the Scarecrow prospect. Lundin continues to grow its Barents Sea portfolio with 3 new licenses and 2 extensions. Both Lundin and Aker BP managed to pick up licenses on the northern part of the Loppa High, one of the core areas of Lundin with the Alta/Gohta appraisal project. In 2018 the operator spudded the Pointer/Setter well and have plans to drill Alta Sør in 2019. As a partner Lundin participatse in Gjøkåsen,and later this year Korpfjell deep and Shenzou, operated by Equinor.